FOXBOROUGH, Mass. -- What would you do to play for an NFL team? 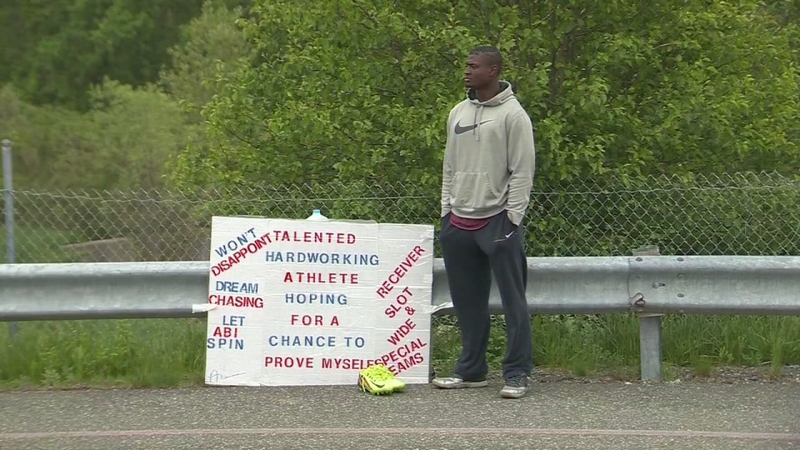 One man has been standing outside the New England Patriots parking lot in Foxborough since April trying to get a tryout. Commitment doesn't always take place on the field, sometimes, it stares you down and stands on the road with a handmade sign taped to a guardrail. Since the end of April, Abiola Aborishade has spent an average of seven hours a day outside the New England Patriots' Gillette Stadium with a sign that reads, "talented, hardworking athlete hoping for a chance." Abbi is there every morning before the players and coaches arrive and at the end of the day when they leave. "I know a lot of them by the cars they drive," he said. The 23-year-old was born in Nigeria and lives in Attleboro. He played three years at UMass Dartmouth, where he holds the school's single-season catch record, hauling in 84 passes his senior year. "Football is football no matter what level you play," Aborishade said. "The speed does change, but understanding the game is definitely a big part of it." Players are noticing. Malcolm Butler posted Abbi's picture on his Facebook page with a caption that reads in part, "This is the attitude you must have if you really want something...#NEVERGIVEUP." "I'm hoping that at some point they'll drive by and say, 'OK, we want to see what you can do.'" Even the woman who bakes cookies every week for the players dropped off a dozen homemade chocolate chip cookies. "This young man has been standing here for a long time working hard, and I give him credit," said Joanne Hensas. Abbi is ready. He even carries his cleats, ready for the chance to fulfill a dream to become a Patriot. "I believe I have what it takes to play at this level," he said. I've been working at it my whole life." Abbi said he is willing to wait months if it means he can trade the shadow of Gillette Stadium for the spotlight on the field.